True crime author Ann Rule is currently working on her next books. Fatal Friends, Deadly Neighbors will be out as an original paperback on November 27, 2012. Practice to Deceive, a hardcover, will be out in the spring of 2013. Christine Schwab is working on research for her next book. Here’s a time frame hint. What did we ever do before Google? The writing fever has hit Christine when she starts making scribbled notes in the middle of the night and awake at 4:00 ready to go downstairs to her computer. Sound familiar to any of our other writers? Game Over by Bill Moushey has received mixed reviews since its April 17 mass market release. Click here to find an interview with Bill discussing the book. New York Times bestselling author Jen Lancaster’s THE TAO OF MARTHA: One Neophyte Homemaker’s Year of Cooking, Crafting, Decorating, Organizing, Gardening, Celebrating, and Generally Attempting to Emulate the Zen of the Ultimate Domestic Goddess; Or, Why I’m Never, Ever Getting All That Glitter Off of the Dog, was optioned to Tracy Bernstein at NAL by Scott Miller at Trident Media Group. Three Merry Mysteries: Three Short Mysteries: A Sticky Affair, Million Dollar Murder, and Diamonds Aren’t Forever by Judy Ann Davis is now in paperback on Amazon and coming soon to Kindle. The book contains three short mysteries and two bonus short stories. S.P. Miskowski’s book Knock Knock has been nominated for a 2011 Shirley Jackson Award in the novel category. Chris Karlsen received a five-start “Top Pick” review for Golden Chariot at Night Owl Romance Reviews. Nicholas Boving posted two new Maxim Gunn adventures on Smashwords: Maxim Gunn Downunder and Maxim Gunn and Sheba’s Necklace. The Emory Wheel reported that college junior Michelle Izmaylov was contacted by Gilt Entertainment recently. Galaxy Watch, a novel she had published in high school, was selected for a three-year media contract and could be made into a film. Dublin author Robert Craven was recently featured on Joe McCoubrey’s blog. Mark of the Seer by Jenna Kay is now on Books A Million. The Daily and National Geographic Magazine are among nominees for the 16th annual Webby People’s Voice Awards. Click here to cast your vote. Ron A. Sewell has three more books in his The Collectors series ready to go, and is working on the next with number six planned. Submissions are open in twelve different categories with no entry fee for the Forward Literature Award. You can get Aaron Sawyer’s ‎Lord of the Mullets autographed $6.99 at his web site. There’s a limited supply, so act now! Click here to watch the trailer. Do you have news that you’d like to see in an upcoming column? Either post it on a related site or email lori@authorsonshow.com before the following week. Also follow me on Twitter @lacarrington1. When Game Over: Jerry Sandusky, Penn State, and the Culture of Silence (William Morrow, 2012) was first released, I had the initial impression that it would be a “rush job” work meant to cash in on a current scandal. Even though I was right in a few cases, I was pleasantly surprised in others. Game Over didn’t tell much that I didn’t already know from extensive media coverage of the Jerry Sandusky/Penn State scandal, I was pleased to see that it wasn’t written in a sensationalized manner. Evidence against Sandusky is very well-presented with some sublime investigative journalism. The truth needed to be revealed without the sensationlism and fluff of tabloid journalism, and Game Over is just the beginning of what could be a line of books covering the Penn State scandal. While nothing is sugar coated in Game Over, it respectfully portrays all parties involved. I admire the authors of taking on such a Herculean task of writing about what many see as a difficult and painful topic on which I’m sure was a very tight deadline, and able to do it in fine form. It will be a long time before we get over the heinous actions and the victims of them, and the upcoming Sandusky trial will just add to our curiousities. In the meanwhile, for those who want an unbiased story of what may be one of the most shocking stories of the decade, Game Over is a good place to begin. 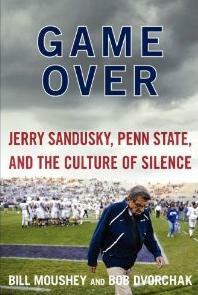 .Bill Moushey first came to my attention a few weeks ago when I saw an interview about his book, Game Over: Jerry Sandusky, Penn State, and the Culture of Silence. In addition to writing the book, I found that Bill Moushey has many other projects on hand as well. For the past 28 years, Bill Moushey has authored award-winning investigative reports for television and print publications, documenting a wide range of abuses in the criminal justice system. Moushey formed the Innocence Institute in 2001 to investigate cases of wrongful conviction in Western Pennsylvania and neighboring regions. He has helmed five investigations for the organization, which have helped result in each of the cases being reopened. He has been an investigative reporter for the Pittsburgh Post-Gazette since 1985. In 1997, Moushey was a finalist for the Pulitzer Prize and won the coveted National Press Club’s Freedom of Information Award for his ground-breaking expose of an out-of-control witness protection program. In 1998, Moushey’s Win at all Costs series about prosecutorial misconduct won local, national and regional awards. He spent five years as an investigative reporter at WPXI-TV in Pittsburgh, an NBC affiliate, before coming to the paper. Moushey is an associate professor of journalism at Point Park, teaching classes in investigative reporting, media law and other subjects. A native of Canton, Ohio, he earned his Bachelor of Arts in journalism from Kent State University. In 2004, he earned his Master of Science in criminal justice administration from Point Park. Moushey has also attended and presented at numerous schools, conferences and conventions related to journalism, writing, crime and punishment, and other issues. Anuradha Roy’s debut novel, An Atlas of Impossible Longing, was a favorite among readers and literary critics alike. She hasn’t lost her talent for beautiful prose, vivid descriptions, and wonderful storytelling in her second novel, The Folded Earth (Free Press, 2012). 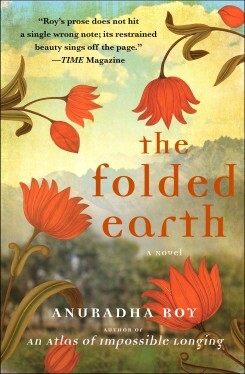 Released in the UK and India in May 2011, The Folded Earth has been reprinted in 16 languages, shortlisted for The Hindu 2011 Literary Prize for Best Fiction and longlisted for the 2011 Man Asian Literary Prize.. The Folded Earth flows with genius and love of language as it tells the story of Maya, who flees to Ranikhet in an attempt to escape the loss of her husband Michael. Ranikhet is a rural village in the Himalayas’ foothills, and readers can’t help but feel Maya’s pain and solitude as well as peer into her perspectives on her landlord and friend Diwan Shahib, an eccentric former nobleman, and a feisty peasant girl, Charu, who convinces Maya to teach her how to read and write. If there’s ever an excellent example of “show versus tell” in novel writing, The Folded Earth rates at the top. Not only was it not difficult to become immersed into the story right away, but also easy to picture the scenery in my mind of the rural village and appearances of each character. Just as she had in An Atlas of Impossible Longing,, Anuradha Roy displays a strong literary gift of blending psychology with nature. It is a beautiful book that shouldn’t be missed. Christine Schwab attended a wonderful event April 17 for the Arthritis National Research Foundation to meet their board members and many of the research scientists who have received grants from the foundation. The young scientists talked about the research made available to them because of the foundation’s grants. They talked about the future for arthritis, lupus and all of the autoimmune diseases. Out of every dollar raised, 91 cents goes to straight to research. Chip Kidd is possibly the premier book designer in the country. This talk on TED will make you laugh, but will also tell you things about books and book design you might never have thought of before. He also shares his thoughts about ebooks and an idea for an ap that he has. All authors are recommended to view it. Barbara Bentley scored a mention in a San Diego article on the Crystal Harris AB1522 case. Barbara also led a writing workshop April 14 about marketing books. Publishing world is in a major state of flux and we authors must do more besides write. Alfie Robins started a blog, mainly to promote his own work but is adding recommendations and friends’ works. Click here to have a look and be a follower. Curious about editing software for writers? India Drummond offered her take on a few options. Read the entire first chapter of Justin James’ new April 22 book release Scott Sapphire and the Emerald Orchid. Soon to be released byAG Press, LLC: Take My Heart, a book of poetry by Jennifer Tokarz. She is 17 years old. and this will be her second book. Wade Kelly posted a great blog on how writing and editing go hand in hand. Stop in and join Suzannah Burke as she interviews Michael Davidson, author of Austin Nights. Thomas K. Matthews wrote about December 21, 2012 back when most thought it was just four days before Christmas. Check out Ancient Anger. There are lots of new things happening on The Polka Dot Banner. Stop in and watch the changes happen! The Cruiseweight ranked #54 in Kindle Store/ Kindle eBooks/ Nonfiction/ Sports/ Individual Sports/Wrestling on April 16. Fifty continues to sell very well on Amazon. About 13 Kindle copies were sold in early April! Do you have news that you’d like to see in a future column? Either post it on a related site or email lori@authorsonshow.com before the following week. Also follow me on Twitter @lacarrington1. Anuradha Roy’s first novel, An Atlas of Impossible Longing, has been published in 16 countries and translated into 13 languages across the world. It has been named by World Literature Today as one of the 60 most essential books on modern India and was shortlisted for the Crossword Prize. 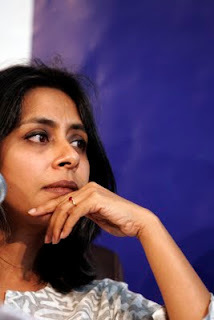 Anuradha Roy was educated in Hyderabad, Calcutta and Cambridge (UK). Her journalism and book reviews have been published in Outlook, India Today, Outlook Traveller, Biblio, Telegraph, Indian Express, and the Hindu. She works at Permanent Black, an independent press publishing in South Asian history, politics and culture. She lives mainly in Ranikhet, India, with her husband Rukun Advani and their dog, Biscoot.